Last edited by waverider on Tue Jan 24, 2017 7:42 pm, edited 2 times in total. Two Rummel players were offered this week in Ja'Marr Chase (WR) and Aaron Brule (S). Brule is rated 3* on 24/7 with their "crystal ball" prediction that he is 100% going to lsu. No rating for Chase bu shows offers from Ole Miss, TCU among others. Also predicting lsu. Chase has picked up a Florida offer. We have offered Ehret 3* WR Jammal Houston who now has 20 offers. Fwiw, 24/7 has him leaning toward lsu where he was recruited by Jaluke and former WR coach Craig. I agree with lg in that WF should find place for Jaluke on his Staff. Right now we don't seem to have much going on in the N.O. Metro area. I have a question: does any 4* or 5* from the New Orleans area, a full year ahead of his signing day, get crystal-ball-predicted anything other than "100% LSU"? I mean, short of the kid having a dad who won a national champioship under Gene Stallings at Alabama and a mom who was a cheerleader for the Tide, aren't they all going to be predicted to go to LSU at this point? They actually show 67% lsu and 33% Tennessee for him but your point still stands. Kaare Johnson said that Alabama signed more "elite talent" from Louisiana than lsu so they may want to start changing their predictions. Willie Taggart catching some heat in the press from local (Tampa) HS coaches for not recruiting their schools while he was HC at USF. We need to avoid that type of feeling by HS coaches in NOLA. Why are they always blessed? Give yourself some credit! There's no contradiction between being blessed and recognizing that you worked hard to utilize the talents and abilities with which you are blessed. I value someone who truly is thankful. Can't they be thankful then? That is how I interpret their comment of being blessed. Suggests to me they are thankful! Been seeing a lot of Louisiana kids tweeting about Tulane offers (including a 2019 QB). Can't say Fritz isn't trying. Win 6 or 7 games and they'll start to consider coming here. there are a lot of good QB prospects for 2019 in the immediate area. There's the kid we just offered, Travis Mumphrey of Ehret, Harold Blood of Destrehan, who came off the bench to do a good job this year, Chandler Fields, who has just transferred to Rummel from Holy Cross, and Johntae McDowell of St. Paul's. We have offered about 4 or so Georgia kids over the past couple days. One of the Ga. offers was to a running back. 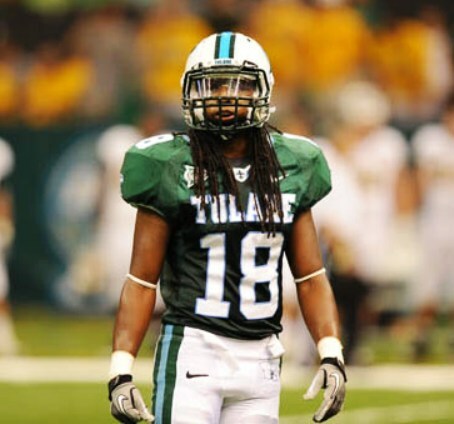 It's also reported that we offered Wayne Toussaint, ATH of Plaquemine, LA. Here's a local name to watch though I have't seen him on the earliest lists of prospects (that won't last): WR Kym Wimberly of Holy Cross. Wimberly, a Holy Cross teammate named Kyree Curington, and Curtis RB Marquese Albert visited campus yesterday.